I am a wife and a mom to three sweet babies. They are my greatest joy. From the moment I found out I was pregnant with Kinley; I became completely obsessed with newborn photography. I wanted to learn all that I could before her arrival. I wanted to be able to capture every single detail before she changed. I still have that same passion today, I want to capture it all so that I will always remember. I feel so blessed that I get to be a stay at home mom and a photographer. There is nothing I’d rather do. My style is pure and simple with a combination of lifestyle and portrait photography. 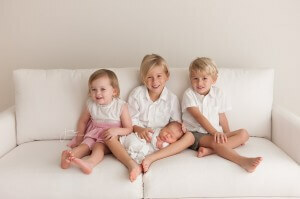 I use soft colors and textures making sure my images are timeless and that the focus is always on your baby. Please glance through my portfolio and blog. I’d love the opportunity to work with you. Email me if you’d like to set up a session. Jennifer Cusimano is a studio and on-location, natural light portrait photographer. She specializes in newborn and baby photography. Jennifer Cusimano Photography is based in Houston, TX and serves the surrounding Houston areas. There is no doubt that this Christmas is going to be extra special for this family. Merry Christmas to you all and welcome baby Reid. Mary Kathryn. Houston newborn photographer. I photographed Russel not too long ago. Take a look back at his newborn photography session HERE. Now here we are 20 months later with his sweet little sister, Mary Kathryn. Y’all have such a beautiful family. I know you are one proud mama. Baby Baron + his sweet family. Baby William + big sister. Take a look back at her newborn photography session HERE. baby bennett. Houston newborn photographer.